a(MUSE.) 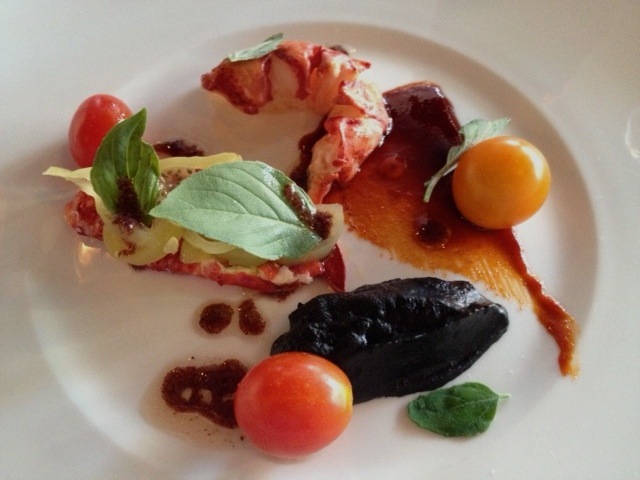 lobster with tomatoes, eggplant puree and honey-paprika paste. Hot dogs, boardwalk fries and soft-serve ice cream are probably among what first come to mind when you hear "beach food." Probably not parmesan gnocchi with black garlic broth and micro chives. However, once you've eaten at Rehoboth Beach's a(MUSE. ), that might change. The restaurant, which opened in 2012, got noticed this year by the James Beard Foundation, which named Chef Hari Cameron as a semi-finalist in the Best Chef Mid-Atlantic Region category. Alas, he did not become a finalist (and thus a nominee), but I wouldn't be surprised to see his name turn up again. On the basis of our recent dinner there, Cameron has lots of great ideas that show both his culinary creativity and ability to satisfy hungry customers. Like all Rehoboth Beach restaurants, a(MUSE.) is a casual place, but the food is clearly taken very seriously. It's hard to choose a favorite because everything we ate was delicious. Frankly, I didn't want to choose at all, so we had the kitchen do it for us, opting for the four-course tasting menu which the chef created on the spot based on our input about likes and dislikes (and allergies). We opted against organ meats and a preference for land over sea and the choices that arrived at the table couldn't have been more pleasing. 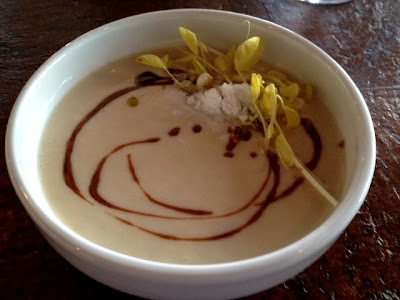 In fact, several of the menu items that sounded the most interesting, like the chilled corn soup, showed up on our table, albeit in forms slightly modified from what the menu offered. That corn soup was particularly good, with its creamy, intensely flavored broth and spicy pickled corn kernels. A little vinegar provided a hit of acid while a sprinkle of corn shoots provided some freshness. While that may seem like a lot of flavors, I loved how they were able to remain distinct but also harmonized, a balance carried through the meal's other dishes. An artful presentation of lobster with heirloom tomatoes and eggplant puree was our first official course (the soup was apparently an extra, albeit a rather generous and tasty one). While I liked the smoky-silky puree, it was the dish's honey-paprika paste that I really loved. 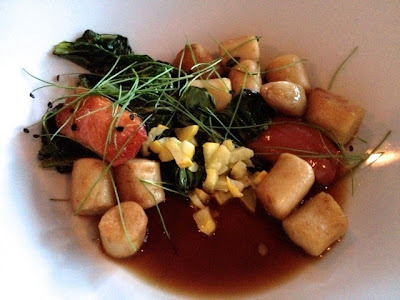 Next up was the gnocchi, served with a selection of vegetables and black garlic broth. The gnocchi had an unusual texture--crusty, but not as if they'd been fried. More like roasted. They also had a cheesy flavor, which our server told us was parmesan. 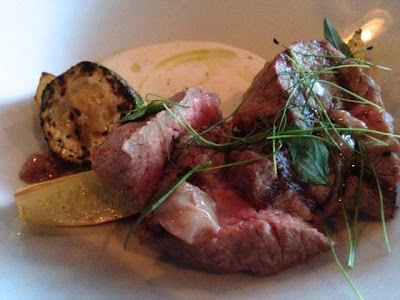 The grass-fed beef in third course was quite tasty, but had to compete, almost unfairly, with delectable grilled summer squash and buttermilk cleverly infused with juniper. I love juniper as a cocktail flavor and I'd never seen it used this way before. 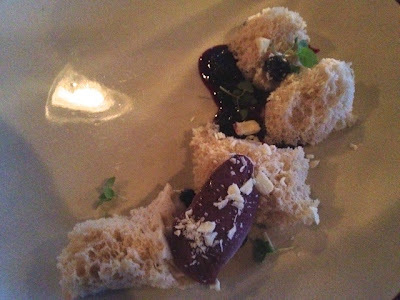 A gouda cheese course provided a brief interlude before the stunning dessert, the "Cake from Heaven," an airy spongecake served with blueberry sauce, white chocolate and blueberry sorbet. Unifying these dishes was the chef's use of young herbs in every dish, various micro greens (including grassy micro chives seen above in the gnocchi and beef dishes), shoots and basil leaves. Although never a central flavor in any of the dishes, they added an important note of freshness, even youthfulness. I'm really glad we opted for the tasting menu. It was fun seeing what came out of the kitchen, and I think the mix of dishes well represented the menu while being a great fit for what we were interested in eating. With prompt, friendly service too, the only downside I see to a(MUSE.) is that it's a 3-hour drive from my house. Not a bad excuse to get back to the beach more often. a(MUSE.). 44 Baltimore Avenue, Rehoboth Beach, Delaware. (302) 227-7107. Reservations: Open Table. This was a really interesting meal. It was also a really good one. Those two things are sometimes mutually exclusive. I hope we can return here here next summer (if not sooner). I agree. The creativity reminded me of Blue Hill, but I think I found the food at a(MUSE) more satisfying. Fortunately we live only 45 minutes from a(muse). We have enjoyed many delicious meals thanks to Hari Cameron's skill and love of his craft. Lucky you. He's definitely quite talented. I'd love to try some of his other dishes.